Today I had lunch at the Stockpot in Old Compton Street. 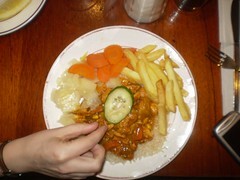 I ordered Chicken Madras and a Diet Coke and got the above pictured Cornucopia of c-word food. 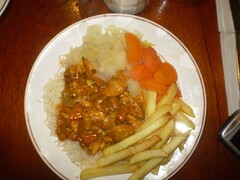 It was a Chicken Curry which included Courgettes, Corn and Carrots, not to mention the Carrots, Cabbage and Chips on the side. Sadly my taste buds were inadequate in discerning how much Cumin or Coriander had been included. In the pictures you can see some of the Condiments also on the table and the second picture has some added Cucumber, offered by my dining partner who’s name *definitely doesn’t* start with a ‘C’. Oh and we sat in the corner.